SAVE THE DATE: AIR FORCE PAINTING UNVEILING! The culmination of this 10-year painting series will be held on Sunday, September 15th, 2019 when the Air Force painting, the last of five paintings will be officially installed. The unveiling and installation will coincide with Camp Ripley’s biennial Open House and Community Appreciation Day, which is open to the public. There will be much more to come about this exciting event, but plan now to attend. 2018, Lieutenant Colonel Børge Gamst; 2017 Colonel Karl-Henrik Fossmann, 2016, Lieutenant Colonel Per Olav Vaagland; 2015, Lieutenant Colonel Ingvar Seland and 2014, Colonel Rolf Wold. As part of the visit, gifts are exchanged, and each receives his portrait sketch. The principal tasks of the Norwegian Home Guard are to safeguard territorial integrity, protect important infrastructure, support national crisis management, strengthen the military presence and provide support to civil society. The Home Guard is divided into 4 regions, 11 districts and more than 200 areas covering all of Norway. Little Falls, MN — On Saturday, May 26th at 2:30 PM, the public dedication and unveiling of the Marine Corps painting, the fourth of five 8 X 10 ft paintings comprising the Veterans Historic Art Monument, installed at the Committal Hall at the Minnesota State Veterans Cemetery north of Little Falls, MN. 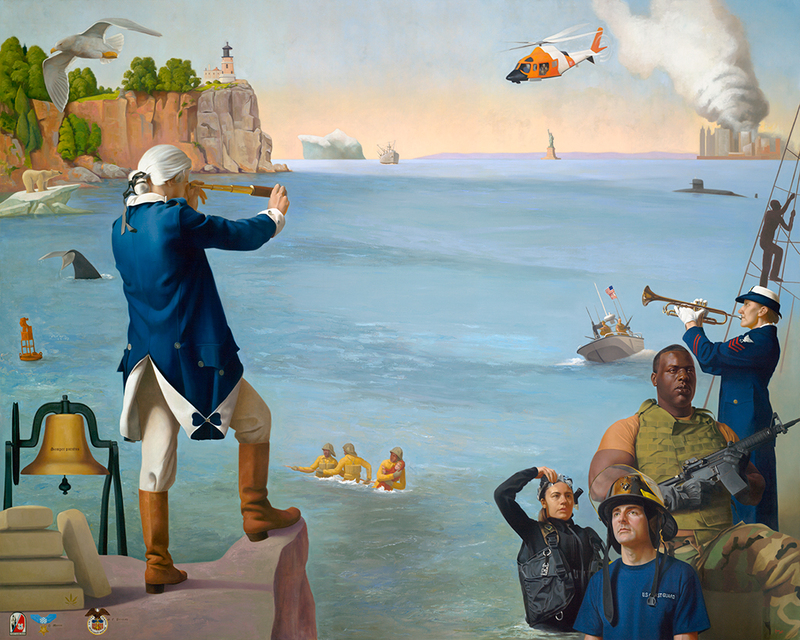 This painting joins three previously completed ones, Army (2011), Navy (2014) and Coast Guard (2016); each depicts the history of, and contributions by our nation’s military men and women. All are painted by Minnesota artist Charles Gilbert Kapsner. Regional in location, but national in scope, each painting uniquely captures the spirit of each branch of service, vividly portraying the stories, faces, and sacrifices of our Nation’s servicemen and women. Veterans and active duty military serve as models, and this painting also includes a small portion of soil brought back from Mt. Suribachi, where the iconic Raising the Flag photo on Iwo Jima was taken. The artist used the small portion of soil to grind in with paint as part of the depiction of the 1945 Marine Corps flag-raising. DULUTH, MN. – Veterans Memorial Hall, a program of the St. Louis County Historical Society, will unveil Minnesota artist Charles Kapsner’s Marine Corps tribute painting at the Duluth Depot. The temporary exhibition is an 8 foot by 10 foot oil painting and will include appearances by the artist. The painting will be displayed from May 17 to May 22, and Kapsner will be just outside Veterans Memorial Hall from 9am to 5pm. Each summer, Charles hosts guests from the Norwegian Exchange (NOREX) which takes place at Camp Ripley in Little Falls. As has become tradition, the senior officer sits for an official drawing. This year, Ltd. Colonel Per Olav Vaagland joined Kapsner at his studio and enjoyed a great visit. 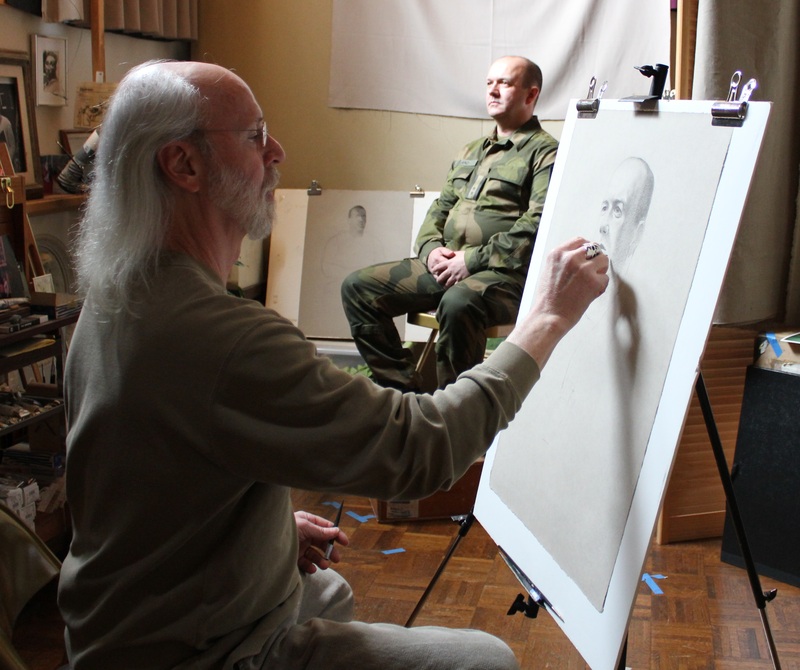 In years’ past, Lt. Col. Ingvar Seland (2015) and Colonel Rolf Wold (2014) had their portraits done. As part of the visit, gifts are exchanged, and each Colonel receives his portrait sketch. A perfect day awaited those who attended. Erik Sogge, Cemetery Administrator provided a welcome. Bill Osberg, U.S. Navy Veteran and member of the Mn. State Veterans Cemetery Memorial Association, served as the Master of Ceremonies, taking over from Jack Peck who served in the role for many years. Joseph Schirmers provided the invocation, and lovely music was provided by the Richfield Symphonic Band and the St. Francis Community Chorale. The memorial address was provided by Colonel Scott St. Sauver, Post Commander, Camp Ripley. The day truly honored the men and women of all branches of the military. Afterwards, everyone was invited to the Committal Hall to view the three completed paintings, with many taking part, asking questions, and pondering the paintings. Momentum has built, as has interest. Here are several videos that capture the initial ideas, things along the way, and recent unveilings. Coast Guard painting installed. 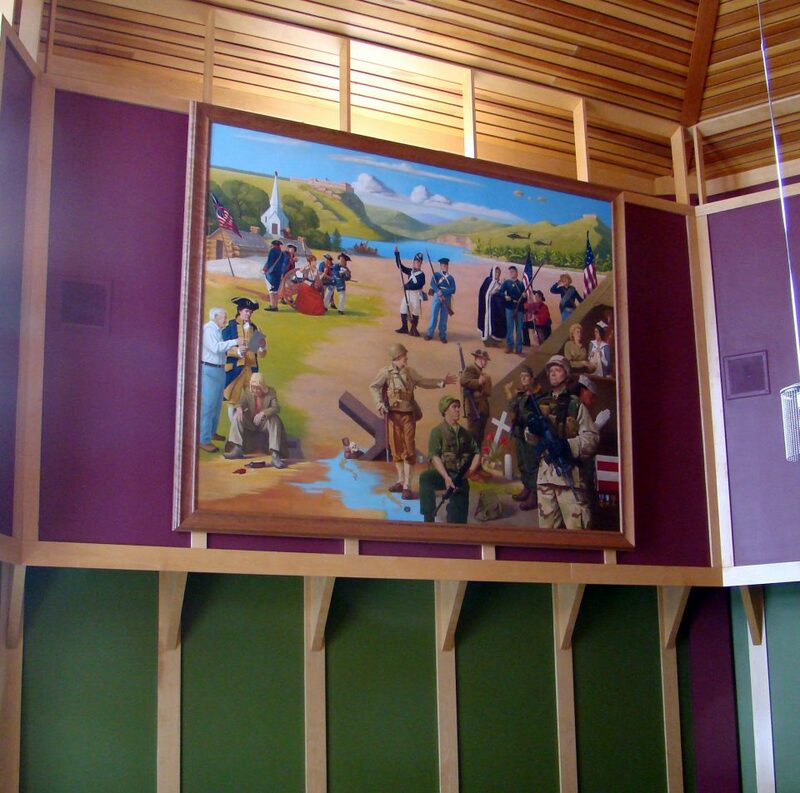 On February 6th, 2016, the Coast Guard painting was permanently installed at the Committal Hall. There was a formal program and a reception at the Little Falls American Legion. The project will be 3/5 of the way completed–with huge thanks to ALL who continue to believe in, and see the impact of this project! This is the finished painting and a story from the 1/29/16 Brainerd Dispatch . Painting on the move! On Memorial Day, the Coast Guard painting was on display for everyone to get a sense of its progress. As you can see, it’s very hands on–with Cemetery Director David Swantek and his crew an integral part of the painting’s safe passage. Thanks to Falls Furniture for loaning us the truck to get the painting back and forth. Norwegian Exchange: Each summer, Charles hosts guests from the Norwegian Exchange (NOREX) which takes place at Camp Ripley in Little Falls. As part of the exchange, senior officers, including Lt. Col. Ingvar Seland (2015) and Colonel Rolf Wold (2014) visited Kapsner’s studio. As part of the visit, gifts were exchanged, and each Colonel receives a portrait sketch, as done by Charles, which includes a “live” sitting. 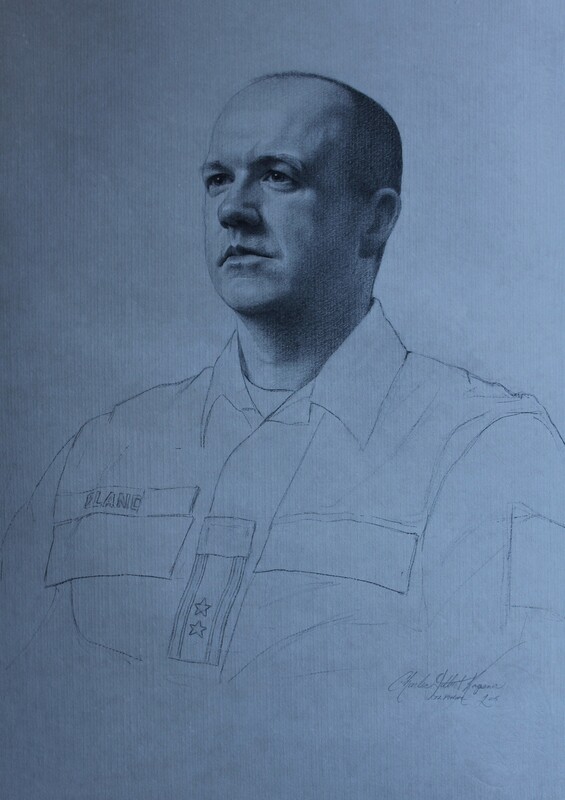 Lt. Col. Ingvar Seland sitting for his portrait.